Footnote spaces are created for every fact, even if they are left blank for the time being. When I make a citation at this stage, I only use the short form because much more material will be added over multiple revisions, and I will only enter the full citation once I know where it is first used. With this rough map in hand, I continue to expand my search for sources beyond those listed by Torrey. I see that I need to access Middlesex County records – deeds, probate, and court. Although these records have been transcribed or abstracted in the Newton Genealogy, I want to assess them, myself, for completeness and accuracy. Fortunately, for Middlesex County, the digital versions of the probate and court records are on americanancestors.org, and the deeds are available at familysearch.org. Richard Newton’s probate file has only one document – his neatly scripted will, obviously written by someone else as it is signed by Richard with his mark. I download this image into the Newton folder on my computer and open it (I use a program named ACDSee), enlarge sections and print them in landscape on legal paper. Later I will compare these images to the transcript in the Newton Genealogy. I next search the Middlesex County, MA: Abstracts of Court Records, 1643-1674 database. These abstracts include dates, names and a brief description of each case. Only five hits come up for Richard Newton and a quick look shows that there isn’t anything exciting here, mostly signed petitions or bonds, but I print them all for reference later. Next, over to familysearch.org for Middlesex Deeds. I go to the grantor deed index (first series, 1639 to 1799) and download and print the relevant section for Richard Newton. 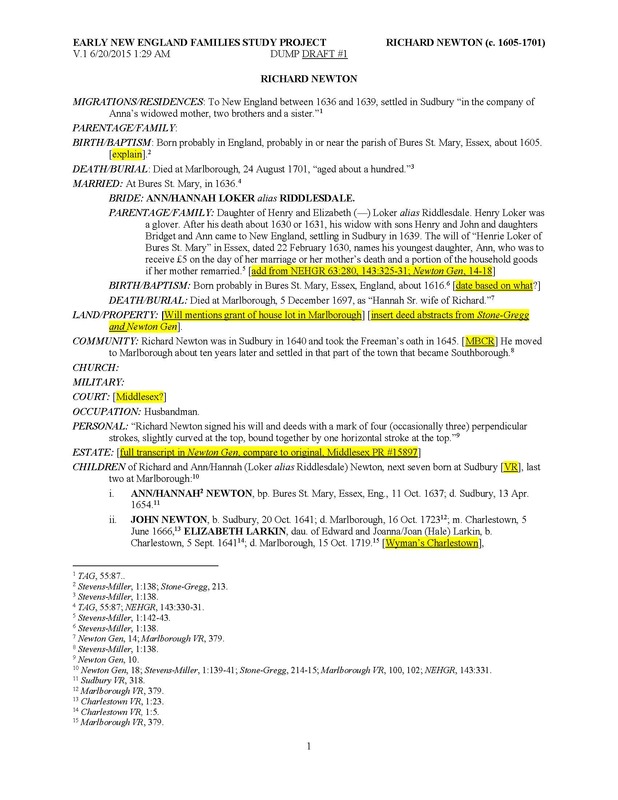 Six deeds have been abstracted in Newton Genealogy with citations to book and page, so I am able to match these with the index. I confirm that there are no other deeds indexed. I will compare the abstracts to the originals on screen without printing the deeds unless I run into a question. 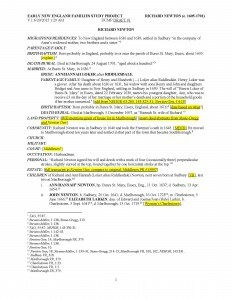 No grantee deeds were abstracted in Newton Genealogy, but I still check the grantee index and confirm that there are none indexed. Next, Massachusetts Bay Colony records. This is a great example, and very useful for organizing and focusing on information still needed. Adding short form citations makes sense, too. Do you have a method for keeping the long-form citations somewhere accessible for when you complete the sketch? A great way to work your way through the “weeds.” Nicely done! Bruce, now I just need to get the weeds out of the garden! Carol, yes, I have a bibliography in a Word file and have accumulated enough sources now that I can usually copy and past the long citation right from it. Alicia, this is a great example for family history writers: those who think they can’t write because they still have “holes” in their research. Our advice is always to start writing, and highlight what you need still to find. And here you show us just how to do it! Incipient writers, take notice. Penny, thanks. Since I am a professional typist, it is a lot easier for me to quickly put my thoughts down “on paper” than some others, and I think that has a lot to do with some reticence to begin writing. But, everyone, remember the Dump Draft doesn’t have to be neat! I love it and will definitely use it! Thanks so much for this article. It’s fascinating to see how different people work from research to final product. I sort of stumbled into something similar, first from index cards and highlighters when in school to a digital equivalent. What I like here is the creation of a footnote for each fact – even if blank in the beginning. I will definitely add this as a step toward the front of a draft project rather than the back. That is very helpful. Miranda, thanks. The footnote trick was something I learned early and is well worth it. Very interested in following your posts! 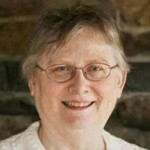 Susan French (Riddesdale) is my 9th GGM. She was born 20 APR 1584 in Boxford, Suffolk, ENG & died AUG 1658 in Ipswich, MA. She was married to Thomas French, Sr., in 1608. Linda, thanks. The Riddlesdales are an interesting family. Linda, she is mine as well. Daughter Mary French married George Smith. Hello, cousin! My line descends from Mary’s brother, John French, Sr. Very pleased to connect with you! I wonder if you begin your “dump draft” in a Microsoft Word document or if you use another program. Hilda, yes, I have set up a template in Word with the paragraph headings, etc., so that I can fill the information in the appropriate sections. Thank you very much. Now I know how to begin. Again, I appreciate your response because it is good to get guidance from experts such as you. Wow. You’re an amazing woman; I sometimes lose hope lately that anyone does proper research or even cares—not especially genealogy, it’s everywhere! Makes my OCD-like heart sing with joy! (Or maybe I’m just old and dont like changes……I still work with paper and pens; that screen just doesn’t feel ‘real’ and it’s too much work to flip back and forth when you can have it all right in front of you at once.) You’re giving future generations a marvelous gift, as well as we current researchers. I know they’ll appreciate it, as do I. And thanks for all of the great tips. Picked up several from you I’ll be using soon. BTW, back when I got my first Mac Classic, I went thru all of my index cards and notes and entered them all into a database. Seems it was an early version of Excel. Wow. That was life-changing for me. Being able to sort them by category (name, date, place) opened up a wealth of connections I’d never made with the notecard system. Too many diddly little facts to cross-reference, you know? Now I could even enter dates from jewelry, photos, significant diary entries and so on for an over-detailed timeline for each ancestor. The clues popped out like snakes in a peanut can. I could see when different family branches lived in the same town, and for how long. Relationships I hadn’t seen before showed up, leading to a pirate’s chest full of goodies. Anyway, Hilda’s comment/question made me think of that. Havent used it in years. PAF has a great sorting system; you can look up almost any fact and sort for it. I keep it up to date for that reason, altho I do use FTM because it synchs with ancestry.com. Debra, thanks. I use Excel and Access to create finding and sorting aids, although I have a bad habit of not keeping up. I also have had Clooz for many years, but not enough time to populate it! Ms Crane, I will be in Boston next week and wonder if I could chat with someone regarding early historical events in Hingham Ma. I am related to Beal,Hobart, and Ripley families, and would like to better understand the events with the train band, the problems with Gov Wintrop, the church building controversy. Looking forward to your response. Nancy, I don’t work in Boston, so unfortunately cannot meet with you. I suggest contacting David Allen Lambert, the Chief Genealogist, dalambert@nehgs.org. Hope you have a good trip.